The Partiologist: 70's Theme Party! 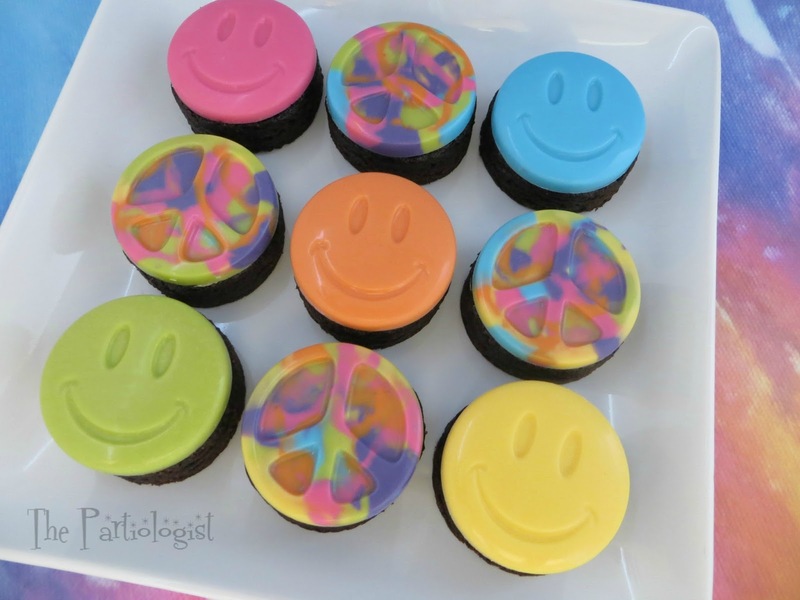 Both the Peace Sign and Smiley Face toppers were made with OREO cookie molds. Get your chocolate cookie molds ready. Start with colored candy melts and to make more vibrant colors, add candy coloring, make sure your don't use food coloring. For the Peace Sign, I drizzled a little of each color in the mold. Then I popped it in the microwave for a few seconds and swirled with a toothpick. Let harden in the refrigerator and turn the mold over and they pop right out. 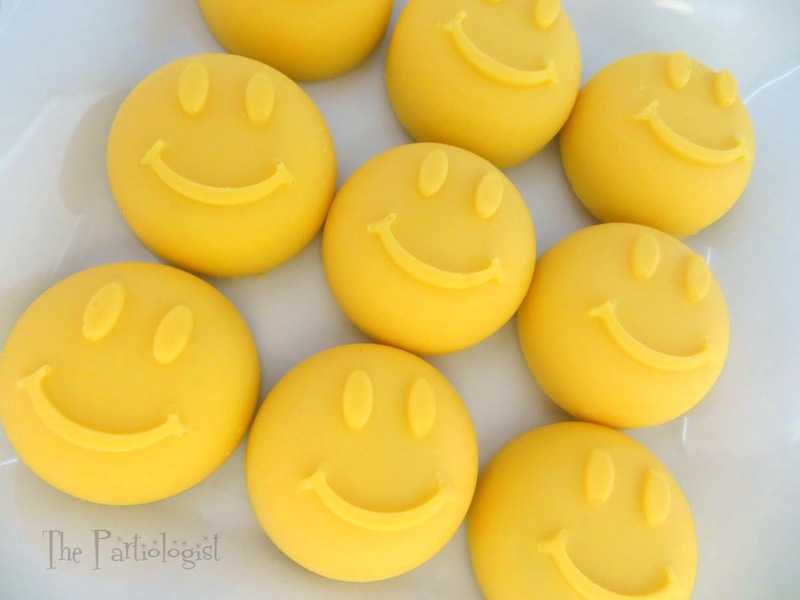 The Smiley Face was so simple, just add enough candy melts to the bottom of each mold. Let harden in the refrigerator and turn the mold over and pop out. Make a 9 x 13 pan of brownies and freeze. Take the brownies out of the freezer and let thaw just enough to cut a sharp circle out of the brownie with a cookie cutter. Measure the candy melt topper with the right size cookie cutter and cut enough brownie rounds for your project. Top with a little chocolate ganache or frosting. 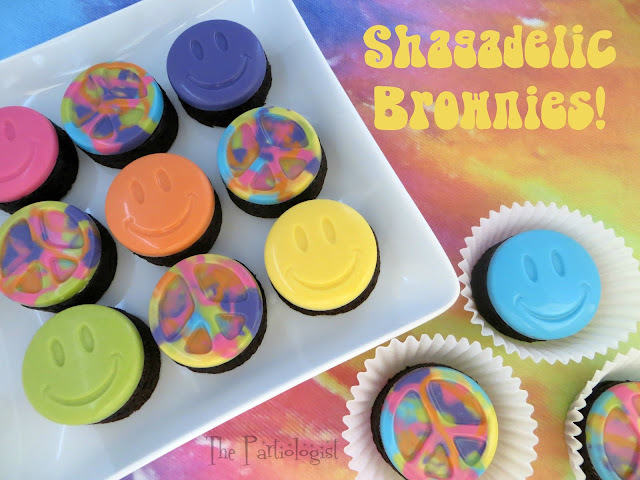 Stick the Peace Sign and Smiley Face on the top of the brownie. Ready to get the skinny on it? After melting the colored candy, pour in the mold with a lollipop stick. Let harden and pop out of mold. You could leave them as they are, but I decided to add the black smiley face with fondant. HAPPY Chocolate Covered Oreo's - I'm pretty sure that's why they're smiling! I'm not sure, but I think this mold was for ice cubes. And because I like chocolate better then ice, I filled it with yellow chocolate candy melts and added a MINI Oreo to the center, covered it with more candy melts. Let harden in the freezer and pop them out of the mold. Next week I'm going to share a few more funkadelic favors and I'm psyched, can you tell? oh me definitely like!!! you put a big smiley on my face this morning! :)! Smiley faces and peace signs were such a big part of my childhood and these sweet treats are perfect for a 70's party. I am having such fun recreating all those 70's things from the past! Can't believe how many decades have passed since the 70's!!! Great theme for a party and great treat ideas. Such fun memories of that place, wait til you see the cookies I made!! These are so great! They are going to be a hit at the 70's party!!! I love the brownies and the smiley faces are so adorable! Love it all! Thanks so much - After making all the treats, now I want to have my own 70's party!! I love the Oreo cookie molds! I've never thought to combine them with brownie rounds though... love it!! Your treats are so groovy! I do believe that your happy faces are so much cuter than the ones I sewed on the pockets of my jeans back in the 70's :) Such a fun party! Super fun theme! Love all the treats! Thanks for sharing. I love and LIVED the 70's - Thanks so much for the comment! 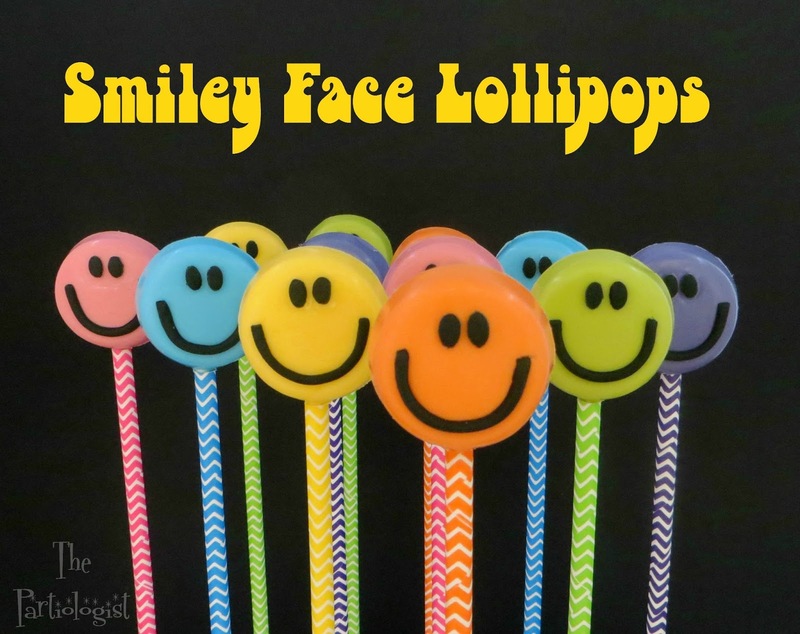 Thank you Jill, I hope the kiddos love the smiley face pops too! 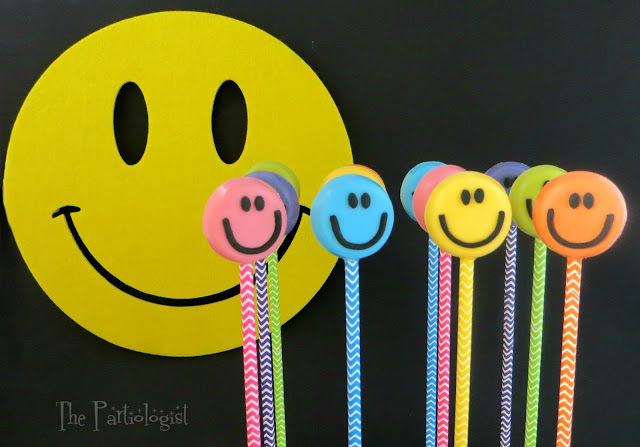 Your smiley faces are perfect! I used to have them all over the place! Don't they bring back such great memories?? Thanks for the comment, Sue!